Eton's Raptor doesn't know if it's a radio, a weather-gauge or a bottle opener. 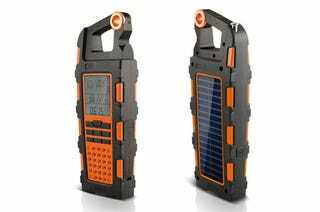 An inbuilt solar-panel charges the li-Ion battery, powers the AM/FM/digital tuner, and also juices-up your phone through the miniUSB port. Planning an expedition through uncharted territory? You also get a compass, chronograph, altimeter and barometer to keep you on track and informed of atmospheric conditions. There's a clip for your utility belt and of course, it's rubberized for waterproofing and shock protection. There's even a line-input for amplifying your iPod, too.